It has four items inside it. Each gm contains Swarna Varka 0.2%, Turmeric Extract (Curcuma Longa) 0.5%, Lotion Base. 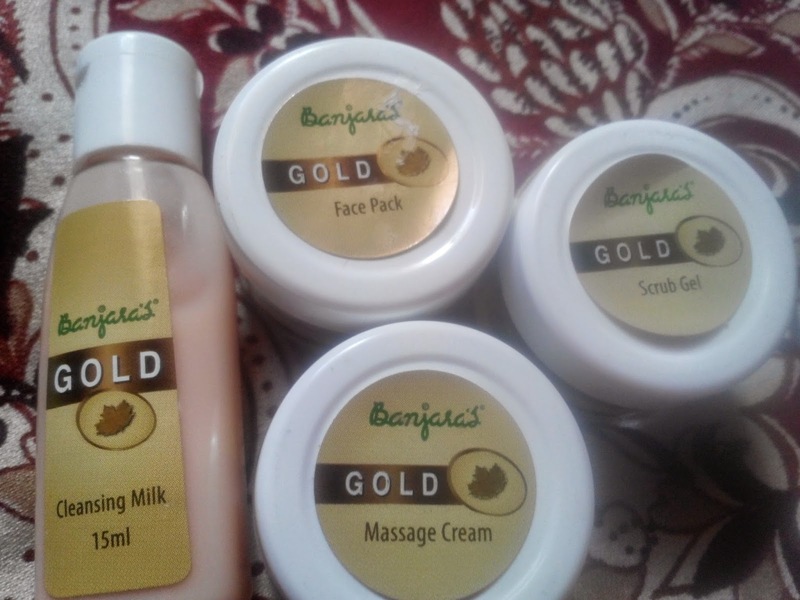 Apply a small amount of Banjara's Gold Cleansing Milk on the skin and gently massage in a circular motion for 3-4 minutes. Wipe off with cotton. Each gm contains Swarna Varka 0.2%, Sandalwood Extract (Santalum album) 0.5%, Walnut shell powder (Juglans Regia) 0.4%, Gel Base. 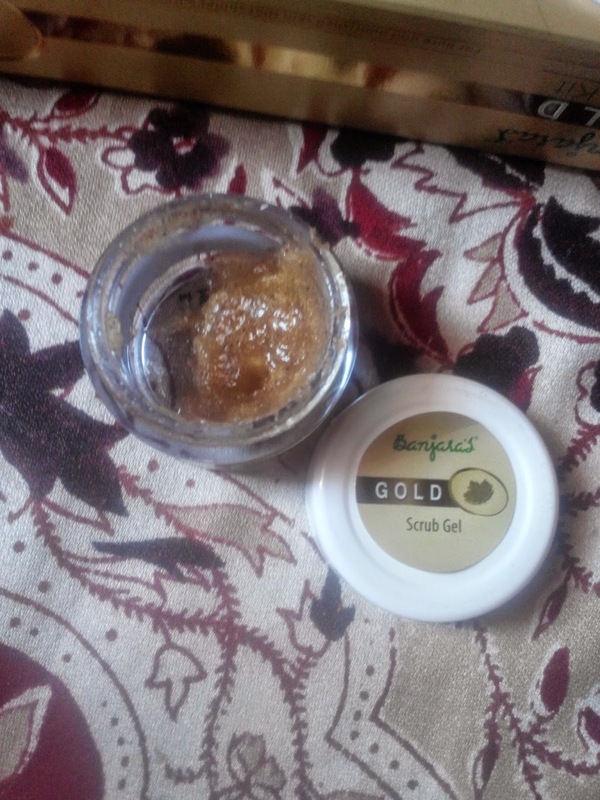 Apply a small amount of Banjara's Gold Scrub Gel on the skin and gently massage in a circular motion for 4-5 minutes. Wipe off with moist cotton. 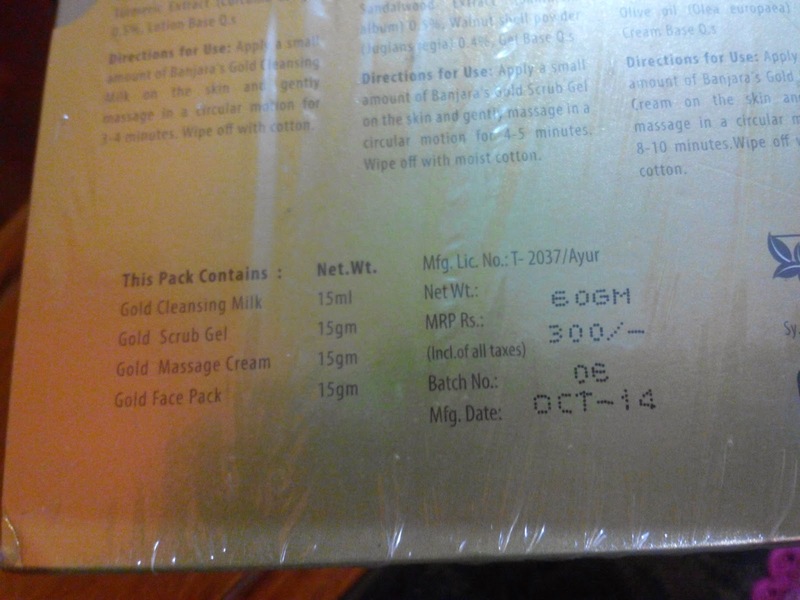 After using the scrub, I used Gold Massage Cream. 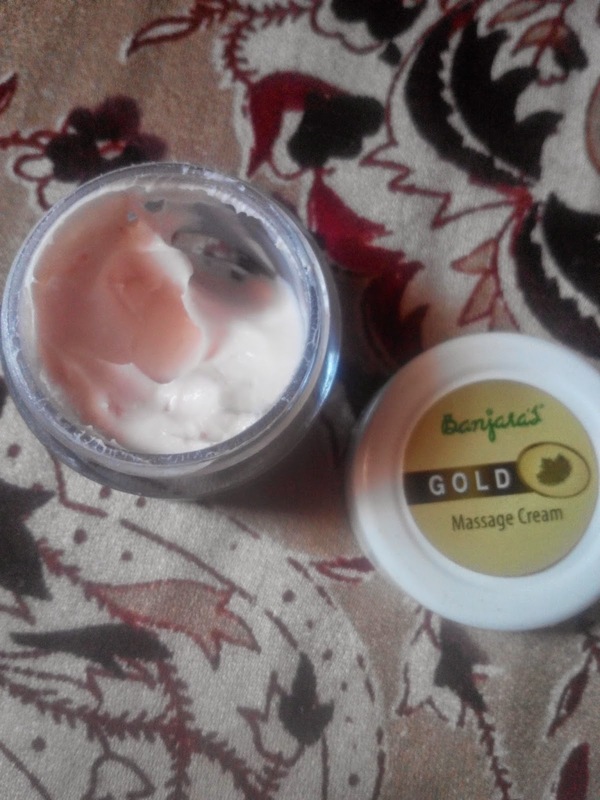 Banjara's Gold Massage Cream is enriched with Gold Dust and essential oils that nourish the skin and improve its elasticity. Regular use will make skin healthy and radiant. Each gm contains Swarna Varka 0.2%,Almond oil (Prunus dulcis) 1%, Olive oil(Olea europea) 0.5%, Cream Base. 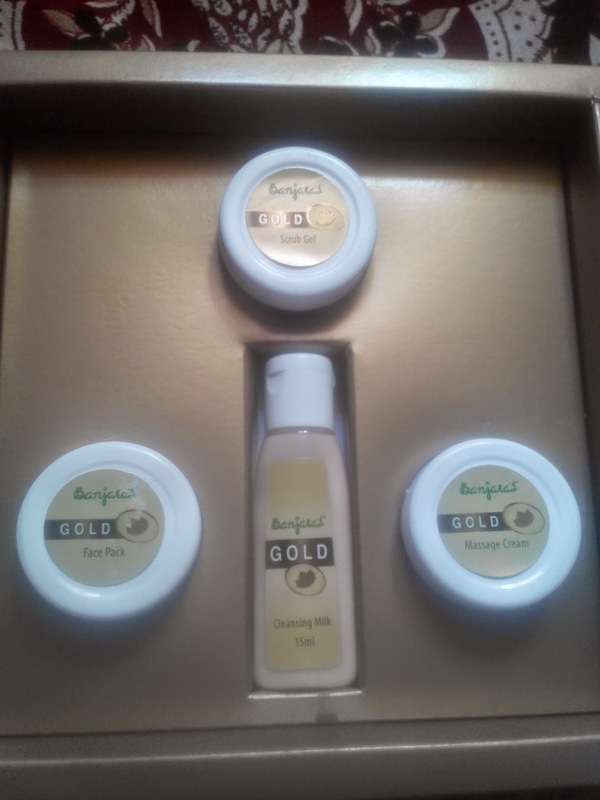 Apply a small amount of Gold Massage Cream on the skin and gently massage in a circular motion for 8-10 minutes. Wipe off with moist cotton. The last product that I used was Gold Face Pack. 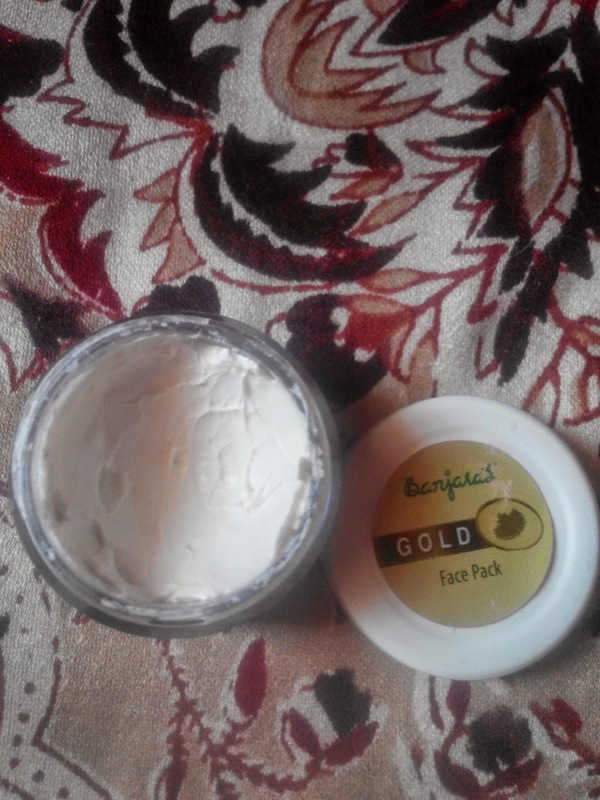 Banjara's Gold Face Pack is a unique blend of Multani Mitti and Gold Dust. It purifies the skin and helps reduce acne, blackheads and whiteheads. 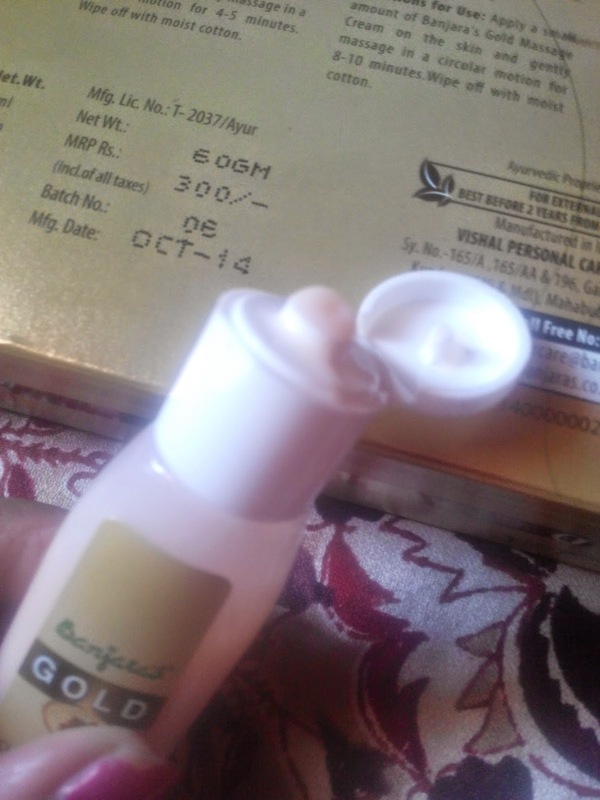 Gold Dust gets rid of dark spots and pigmentation leaving skin flawless and radiant. Each gm contains Multani Mitti 15%, Kaolin 20%, Yashada Bhasma 5%, Sunflower Oil (Helianthus annus) 2%, Turmeric Powder (Curcuma longa) 2%, Swarna varka 0.2%, Cream base. 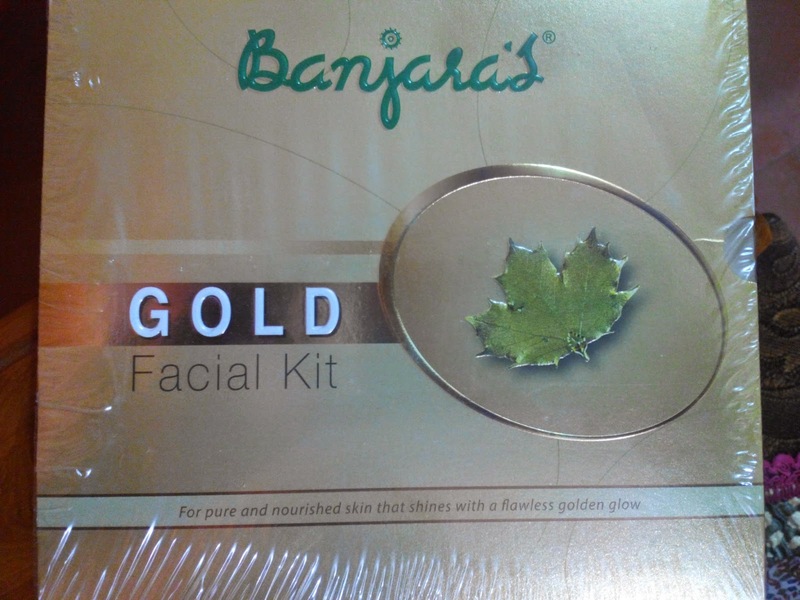 Apply Banjara's Gold Face Pack evenly on face and neck, avoiding the area around the eyes and mouth. Leave it on for 15 minutes. Wash off with water. Price: 300 Rs. for a small pack and 800Rs for a big one! Planning to give it to try? ?